Dip PE, B.A., M.Litt., B.D., CPE RNSH, Grad.Cert.World Religions. Parking on the grounds of our Church is limited, and we prefer Church visitors NOT to use these limited spots as young children are often running around and we want to keep them safe. 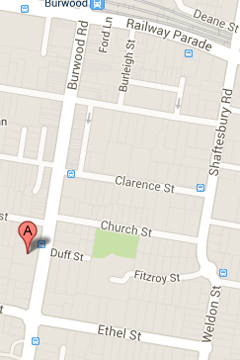 Parking option: Enter by Fitzroy St, park at the Woodstock Community Centre, and walk 100m down Duff St to the Church. Parking on Saturday afternoons and Sundays is unlimited. During business hours parking is restricted to 4 hours. Buses run up and down Burwood Road at regular intervals and the Church is only a short walk from the Burwood Railway Station.